It'd be nice if CNN stopped being the standard for Town Halls. They just aren't trustworthy and do everything they can to put down any threat to their shareholders and prop up corporate interests. The clips they released of the Yang town hall were just the smear questions from people that aligned with them. I'm glad our ambassador program is having a positive impact! 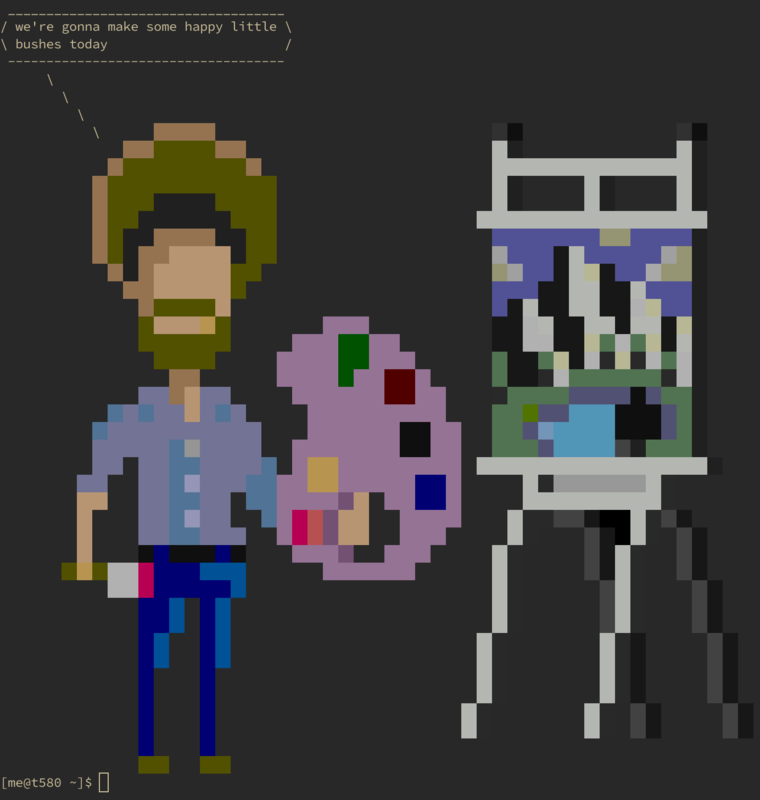 Bob Ross, with cowsay message I made up. I've never been a fan of sticking stats or whatever, or fortune messages. Sometimes I don't like what it says. I always like seeing Bob Ross. It's a client-side extension. From what I understand, it's basically like creating a Reddit post for the page and letting users submit comments, but then also allowing users to view the comments for a page inline while on the page itself. I don't see the issue. If someone doesn't want to see the comments, don't use the extension. Unless browsers are also going to start blocking forums that contain hyperlinks to other pages and comments about them, this seems like a possible overstep, targeted specifically at an organization they don't like. Yeah it's pretty stupid to make it about race, he broke the policies and most likely the law, and knew he was doing it. But it's also stupid for universities to suspend people for marijuana possession. As long as people aren't smoking it in the dorms and aren't smoking it on the sidewalk or public meeting spaces of the university, I don't see the issue with possession. It's such a trivial thing. At a university with 20k students there are probably at least 1k that could during a given year be caught for possession or usage of marijuana if the university really wanted to be draconian about it. And 5% per year is a very low estimate. 14% of US adults use marijuana at least once per year. That amount is almost certainly higher for 18-24 year olds. I do think Buttigieg and Biden are strategizing together so the nomination goes to one of them (with the explicit help of the Democrat party leadership). I thought it might be the other direction though. Biden taking a lot of early support based on name recognition, then dropping out next April or May and strongly endorsing Buttigieg. Then Biden drops out and endorses Buttigieg. It could be Buttigieg dropping out to endorse Biden, but I think the DNC wants to promote Buttigieg in order to present themselves as forward thinking and solidifying the young vote. Biden would be in there to grab old voters, and if he endorses Buttigieg that might transition the old people over to Buttigieg. I find it hard to believe that a lot of young people would vote for Biden, even if Buttigieg drops out and endorses him. Biden is not popular with young people, for good reason. Which organization is responsible for some bloodshed in Africa? I'm interested in reading more about that. I know they were donating to a group that pays sports coaches to preach about the Bible in order to push Christianity on more young people. Zaxby's sandwiches are really good; their chicken is slightly better and their sauce is way better. I think more places have Chick-fil-a than Zaxby's though. Bojangles is also decent but not quite at the same quality tier. I believe Yang just said he personally doesn't think it is warranted and wouldn't do it, and that our medical services should inform parents beforehand that the medical claims are not backed up, and about the fact that the US is the only developed country in the world that has any significant portion of the population doing it. Many parents have the incorrect opinion that it is a standard procedure and is very medically beneficial and has no downsides, and it should be the role of a medical professional to correct that misinformation. Right now most parents are not adequately informed before making the decision. Lmao the US media is so freaking corrupt. They don't just report on what happens in the country. They manufacture stories and manipulate public opinion, even if they make it seem like they're unbiased. The example given in that video is so blatant. It's like the coordinated media blackout on Ron Paul in 2012, where media outlets across the spectrum all agreed to refuse to say Ron Paul's name in their reporting. There were repeatedly listing out the top GOP candidates and just skipping right over Ron Paul and including people with way lower polling. One show literally listed out the top 4 GOP candidates at one point and the show host just refused to say Ron Paul's name, even though he was in 3rd place, just pretended he wasn't on the list. People are dying to get in, and undying to get out. The council of /var/spool/mail/root readers will decide your fate. Imagine accidentally coughing and shaking the camera in a quiet, low motion scene well into the movie's runtime. They could call it "Best Non-Anglosphere Film". So even if it's mostly in English, as long as it's produced in a Non-Anglosphere country that's still eligible. But depending on the definition of Anglosphere, that could exclude countries that many would think should probably included in "Foreign films" from the perspective of the US, like Phillipines, Netherlands, Sweden, Israel, Denmark, Sierra Leone, Singapore, Jamaica, Trinidad and Tobago, Guyana, Bahamas, Barbados, Belize, Vanuatu, Grenada, Dominica, Palau, Nauru. All of which have over 80% of the population being fluent in English. Maybe they should just reevaluate what the actual useful categories are. Maybe the line between primary English and primary not English is not the most useful line. Karma hasn't been real ever since we got off the gold standard. By "local resources" they mean the CPU. Nothing stops JS scripts from running hashing on the CPU. They were definitely using JS in the past and some still are. New scripts are being made to use WebAssembly since it's faster. Mining scripts don't need to break out of sandboxes, they just need to hit the CPU and send hash data to the internet. JS does that fine. "Kit I just watched this random woman shoot you with a bow and 3 arrows"
Source code pro and Ubuntu Mono are both really good distinct fonts. Sure, but after you do this the compiler will end up creating the same code, as those are just literals, and any reasonable compiler like gcc or clang will simplify literal arithmetic or bit flips before generating the compiled version. That will just turn into 0 and 1. The compiler isn't going to put a value flipping instruction into the code. It just probably slows down compilation by a few microseconds. I mean they were right. Automated systems will result in there being fewer jobs. That isn't even a controversial opinion anymore. Say what you will about EA's game design, they do seem good at rapid deployment of content and update packages to users.